Wedding of Cyril Wilson and Doris Gascoigne. See note below. Photo courtesy of David Nicholls. Front row – Lily Gascoigne, Bernice Yeardley, Leslie Gascoigne, Nellie Gascoigne, Alice Wilson & Brian Jones. 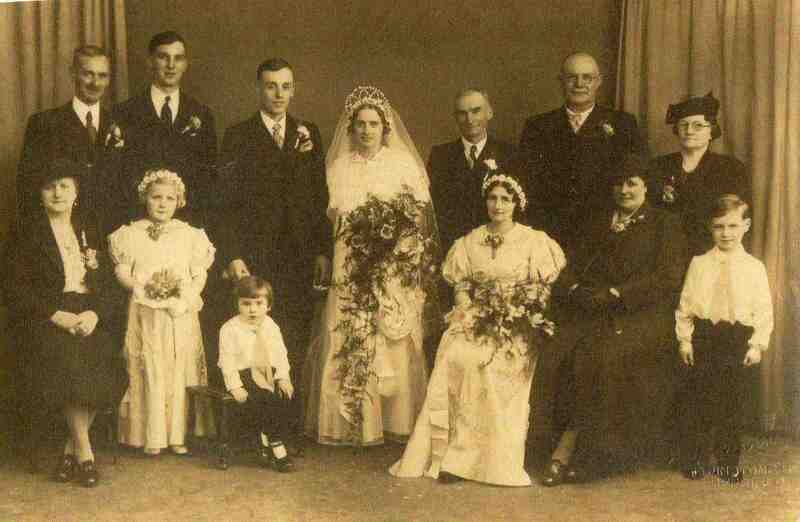 The wedding of Cyril Wilson and Doris Gascoigne. Back row – left to right: ??, ? ?, Cyril Wilson, Doris Gascoigne, Charles Gascoigne, Mr and Mrs Wilson Snr. Front row – left to right: Lily Gascoigne, ??, ? ?, Nellie Gascoigne, ??, ? ?.